Hello my friends! What is going on today? I am so excited you are hear listening, and so thankful you continue to tune in. We have big things to do here so I am thrilled you are along for the ride. If you ask my husband he would say I’m a crazy driver..lol.. my uncle Fuzzy used to say he would ride with a blind fold.. in any case – I’ll tell you what I tell them – I got you – we are all going to be just fine..lol..
Super side note – do you all have the same rule we do? Driver is in charge of the music – always right? Ok – let’s get into our topic – today I want to dive a little deeper on the idea of time management and specifically being busy. If you are anything like me, you might actually put the busy badge of honor on – like each day..lol.. I have always thought being busy is a good thing. For the longest time I thought if I wasn’t busy I was lazy. Rumor has it though that that may just be a story in my mind… and today I encourage you to open up your mind, if it’s something you tell yourself as well. See, what happens in our lives is we grow up with these beliefs – which are just thoughts we’ve had over and over, that now we believe them to be facts, or truth. The way we know they are just beliefs is because not everyone has the same exact idea, so it is not a fact. But then what happens, is as adults, is we tend to just bring the suitcase of beliefs along with us year after year and live the same unconscious life. BTW – I was recently at baggage claim – there are some ratty looking suitcases out there – lol.. the good news is – we can always change what we put in the suit case – and if we are ready to – we can actually change out the entire suitcase for something that serves us better. So, let’s take some time here to open up the suitcase, and decide if we want to keep packing those same beliefs. For me, growing up, and still – my dad is a hard worker. Always working. And I look at that as super respectable and I have always thought in order to do well in the world you must work long, hard hours. My mom is always up early, working out and getting to work. So I have also believed you need to get up early to work out, then get ready for a long day at work. Getting up early to workout is always on my list of things to do. That is actually something I want to keep as my belief – it serves me well. As I go through this I encourage you to start really thinking about some beliefs you may have that you think are helpful to creating the life you want, and those that are not helpful. And in the past I have always believed a long list of to dos is good – because again, busy equals good. But, the more I learn about being “busy” the more I’m working on deleting the word from my vocabulary – getting it out of my suitcase shall I say. Everyone’s definition of busy differs, but the one thing it has in common is, at the end of the day it is simply an optional thought, and one I encourage you to begin questioning. Think about this for your – I know for myself in the past, and clients I work with, we talk about coming home after a “busy” day and needing a drink to unwind. Keep in mind – what is busy for you, may not be busy for me, or vice versa, and therefore the idea of busy really is, simply a thought. “I’m so busy with everything going on around me”. 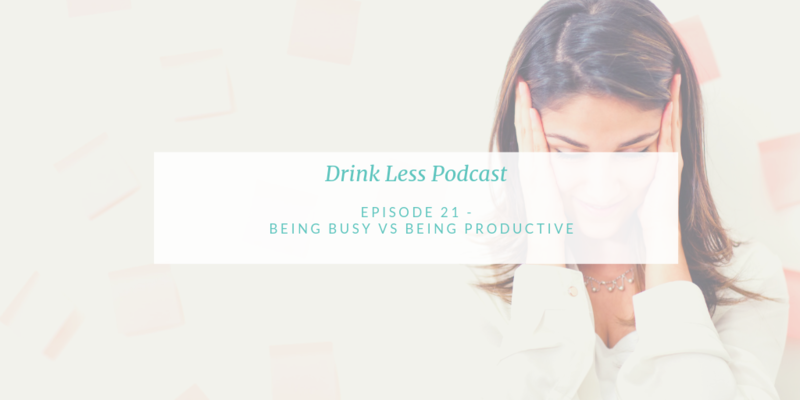 But here’s the thing – Being busy does not mean you are necesarrily being productive. I encourage you to begin paying attention to what you are telling yourself. When you find yourself thinking about how “busy” you are – how you feel? Typically when you are indulging in these types of feelings you are not taking action. You are either, going to sit in confusion because you don’t know where to start, or you are going to try to multi-talk – which in itself never truly works. It’s interesting, As I was prepping for this, I read the term multi tasking originated in the computer realm. And as we get to be more technology driven we think we can multi task more and more, but that is simply a myth. Neuroscience research shows this is actually “task switching”, and although the brain can be fast in switching, it makes for less productivity in the long run. For some of you it may take time to fully grasp this – I know it did for me – because for so long we have prided ourselves on these ideas of multi-tasking, and being able to do it all. And trust me ladies – I know we tend to do it all, but being open to some of these new ideas may help you feel more in control of what is going on, and when you are feeling better you may not think you need to head to the extra wine in order to cope with it all. One thing I’ve implemented – that may be helpful to you – is what I call focus time. Now, full transparency – I continue to work on this myself because I know I can get even better – but I like to take at least one hour on Friday where I don’t answer the phone, I don’t return emails I just focus on my most important things in order to get my next week set up. So for me this looks like – completing weekly reports, doing expenses, getting my sales call schedule in place, and calendaring what I know can be placed in a time slot for next week. I estimate this one hour, saves me like 5 the next week because I have a plan, and focus and don’t have to spin around in confusion with a to do list or wonder where to start. Its all on my calendar. It has made such a difference. It’s funny – my coworker will call and when I don’t answer I will later see a text from her… – guess it’s focus time..lol.. So for my people pleasing friends out there who think the world will come to an end if you are not right on top of the phone I want to offer you this – as soon as you are done with focus time you can return calls, and so far – at least from my experience .. nobody has died from waiting one hour for me..lol.. But so many other aspects of the business have benefited because I can focus on that time – by not being “busy”. I mean really, Would you agree we have become a society that thinks multi-tasking is impressive? But multi tasking is a lie, because our brain is not able to focus effectively on two different tasks because different data is in different parts of our brain. Of course we can walk and chew gum. But let’s say you were walking, and you had to talk someone through how perform CPR over the phone – you would stop walking, in order to focus on the instructions. Or – if you were trying to navigate over a tight rope on a bridge over a rapid gorge – you would stop talking in order to concentrate. I get a chuckle thinking about how I have to turn down the radio when I am driving in a place I’m not really sure about – right? Because I have to focus on making sure I’m not getting more lost. Hey – look at that – since you are on this ride with me aren’t you happy to hear I’ll focus? Lol.. So this idea of busy and multi tasking is something I hope you are open to looking at differently..
What I have shifted to, and I encourage you to consider – is being results oriented. When you are results oriented you can focus on the one thing you want to accomplish. Typically what happens is we have so many things on our lists that we begin to get over loaded, discouraged and give up on our dreams. Or maybe because you are so overwhelmed that’s when the extra glasses of wine come in, and then you just end up falling asleep and the next day not feeling so productive and then you just continue to the rat race. So maybe you start small. One of the keys is to be intentional. Let’s think about starting with the one thing that could make a difference. And since this podcast is called Drink Less, let’s start there. Again – if you are looking to weigh less – take the same concepts and apply them to food. The first thing to do is Plan. I talk a lot about developing a drink plan with my gals that are looking to cut back on alcohol, or a food plan if working on weight loss. This is just as important as planning your time. You want to set your brain in a direction that it can focus with intention on what needs to get done, or how many drinks you will have tonight, or what you will eat. Be precise when you make the plan for your time. For example – if it is a work project – how long will it take? Put your brain to work to get it done. Where most of us reside is in this place where we say we don’t really know how long it will take and then the project runs us. What I’m suggesting is different. You decide how long you will give yourself and do it. Think about this – remember back in college when you had weeks to do a report? If you are anything like me I will guess you procrastinated because you “are best under pressure”..lol.. So you did it the night before, and got it all done. Now- imagine that mindset on the front end. Give yourself limited time to begin with, then you have all the extra time on the back end because you are not telling yourself over and over how you have to get all of these things done. Start playing around with it – even if small examples to start – give yourself a certain amount of time to get something done, put you brain to work, and voila – like magic you will get it done. Lastly, you will be amazed at the freedom you gain in knowing there is a plan, sticking to it, and accomplishing your goal. In fact, you will find more time in your day because you won’t sit around in indecision not knowing where to start. You will end your day feeling more confident knowing you put it all out there – planning on purpose, and not wasting a minute. The super cool part is – as you continue to do this, you see greater results in your life, you build an amazing relationship with yourself, as you honor your commitments, you will begin seeing how you truly can create the life you imagine. That’s what I have for you today. Again – I am so happy you are here. If you want to learn more ways to drink less tonight head over to mindfulweighs.com/freebie and download your free guide. Let’s circle back next week – but for now, make it a great day – take care!